Conducted by Paavo Järvi, the hr-Sinfonieorchester (Frankfurt Radio Symphony Orchestra) performs “Das Märchen von der schönen Melusine”, The Tale of the Beautiful Melusine, Op. 32 (MWV P 12), a concert overture by Felix Mendelssohn written in 1833. 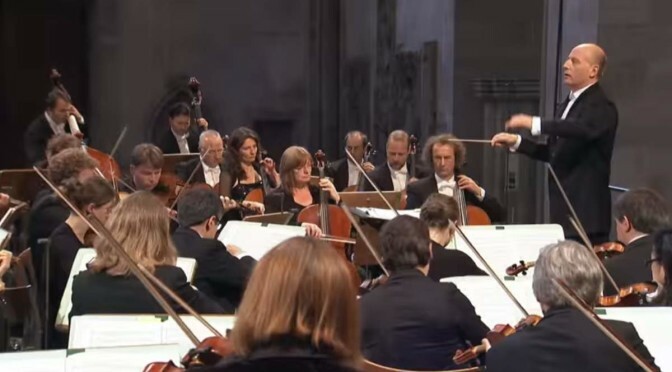 Recorded during the Eröffnungskonzert Rheingau Music Festival 2014 at the Eberbach Abbey (German: Kloster Eberbach), a former Cistercian monastery near Eltville am Rhein in the Rheingau, Germany. A performance of Conradin Kreutzer’s opera Melusina in Berlin (which libretto was by Franz Grillparzer and was originally designed for a setting by Ludwig van Beethoven intended) suggested Mendelssohn on to write its own overture on the substance. Mendelssohn’s piece dealt with the myth of the legendary figure Melusine (a figure of European folklore, a feminine spirit of fresh waters in sacred springs and rivers). The most famous literary version of Melusine tales, that of Jean d’Arras, compiled about 1382–1394, was worked into a collection of “spinning yarns” as told by ladies at their spinning. Coudrette (Couldrette) wrote The Romans of Partenay or of Lusignen: Otherwise known as the Tale of Melusine, giving source and historical notes, dates and background of the story. He goes in to detail and depth about the relationship of Melusine and Raymondin, their initial meeting and the complete story. The three girls — Melusine, Melior, and Palatyne – grew up in Avalon. On their fifteenth birthday, Melusine, the eldest, asked why they had been taken to Avalon. Upon hearing of their father’s broken promise, Melusine sought revenge. She and her sisters captured Elynas and locked him, with his riches, in a mountain. Pressyne became enraged when she learned what the girls had done, and punished them for their disrespect to their father. Melusine was condemned to take the form of a serpent from the waist down every Saturday. In other stories, she takes on the form of a mermaid.